Bokar-Tokoma Aerobics Screwdrivers enable you to remove even DAMAGED SCREWS with ease and speed. This HIGHEST QUALITY Newest Drivers perform just like a Philips head screwdrivers but can remove all types of screws, even the ones which are damaged and/or seized. 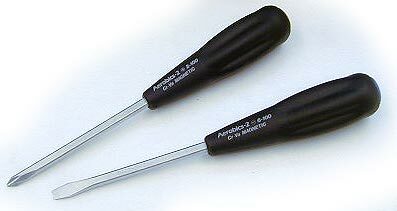 Bokar-Tokoma Aerobics-2, as our Aerobics Screwdrivers use a specially designed tips which are uniquely sharpened. The tips utilize 2 wings instead of the usual 4 wings to transfer the force to the screw. Bokar-Tokoma Tip, is named ALTER-PLUS, because it can drive even the Damaged Screws into hard materials. The Aerobics drivers are constructed using a high strength CR-V alloy steel which has been Hard Chrome Plated for long term durability and high Performance. The Ball type handle enables Heavy Duty Work. Rubber Touch, Newly Designed Ribbed Handle-Grip allows to work non-stop for several hours. To provide superior Insulation, Poly-Carbonate insert is used in the Handle making Bokar-Tokoma Aerobics-2 the ideal Screwdriver for Electronic and Electrical Work. Enable to drive both new & Damaged Screws. The Tip can drive or remove the screws with little of remaining slot. Aerobics-2 for Slotted Screws Unique, patented shape for the flat screwdriver. ALTER-MINUS can be made maintaining NEW SLOT for REMOVAL, instantly. ZAS5075 Flat (-)5- 75 1-pc. ZAS5100 Flat (-)5- 100 1-pc.